Chevy should have included this option to begin with. It’s amazing how cheap this modification is and how great it looks when it’s done. I ordered two blank (no SS logo) headrest kits (part #92240091) for $40.90 each from GMPartsDirect.com (there is no core charge). This kit is not just the leather covers, but the entire headrest piece (leather cover, molded form with posts). 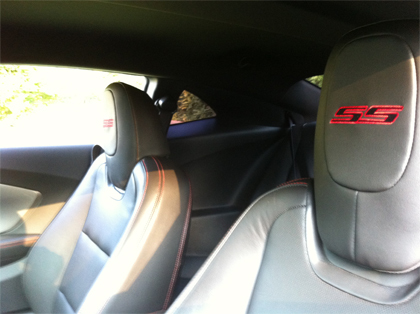 I removed the leather headrest covers and shipped them to Pam at Embroidery Plus in Colorado. It took about two weeks to get them back and they did an amazing job! Best of all, they only charged $10 each!